Today's news seems like a litany of catastrophes: wars across parts of Asia, the Middle East, and central Africa; the largest global refugee crisis in modern times; rising intolerance, racism and authoritarianism in Western democracies; poverty and underdevelopment in vulnerable communities; and instability and conflict driven by climate change. This seminar begins by investigating these pressing contemporary challenges, with a focus on war and violence, examining how extremist nationalism coupled with dehumanizing ideologies can engender war and mass atrocities, systemic discrimination, and entrenched poverty and inequality. Focusing on three areas of the world – the Middle East, central Africa and the United States - we explore these problems from a global and local perspective. The second part of the seminar turns to various peacebuilding strategies and actors. We examine how international institutions like the United Nations can promote the rule of law and reduce armed conflict, how nonviolent social struggles can advance justice and lessen discrimination, and how restorative justice practices can help overcome mistrust and reduce conflict in local communities. In this section of the seminar, we address the following questions: How can we work to establish peace in the face of significant societal challenges? What can we do to promote just and equitable social relations? What conceptions of justice undergird existing peacebuilding practices, institutions, and frameworks? With the help of Notre Dame faculty with expertise on a wide range of peacebuilding issues, we will sketch some ways forward. The seminar concludes with a visit to several community peacebuilding organizations in Chicago, where we will learn about practical strategies to mitigate violence and poverty, and build trust and resilience among neighbors. Atalia Omer is an Associate Professor of Religion, Conflict, and Peace Studies at the University of Notre Dame. She earned her Ph.D. (November 2008) from the Committee on the Study of Religion at Harvard University. Her research interests include the theoretical study of the interrelation between religion and nationalism; religion, nationalism, and peacebuilding; the role of national/religious/ethnic diasporas in the dynamics of conflict transformation and peace; multiculturalism as a framework for conflict transformation and as a theory of justice; the role of subaltern narratives in reimagining questions of peace and justice; intra-group dialogue and the contestation of citizenship in ethno-religious national contexts. Professor Omer's first book When Peace is Not Enough: How the Israeli Peace Camp Thinks about Religion, Nationalism, and Justice (University of Chicago Press, 2013) examines the way the Israeli peace camp addresses interrelationships between religion, ethnicity, and nationality and how it interprets justice vis-à-vis the Palestinian conflict. She is also the co-author (with Jason Springs) of Religious Nationalism: A Reference Handbook (ABC-CLIO, 2013), and co-editor with Scott Appleby and David Little of the Oxford Handbook of Religion, Conflict and Peacebuilding (Oxford University Press, 2015). Professor Omer is a faculty affiliate of the Center for the Study of Religion and Society at the University of Notre Dame. She was also the recipient of a research fellowship from the Notre Dame Institute for Advanced Studies (Fall 2011), Charlotte W. Newcombe’s Doctoral Dissertation Fellowship (2007), and Harvard University Merit Fellowship (2006). She was a doctoral fellow at the Center for the Study of World Religions at Harvard University (2002-2004) and a Graduate Associate at the Weatherhead Center for International Affairs at Harvard University (2006-2008). 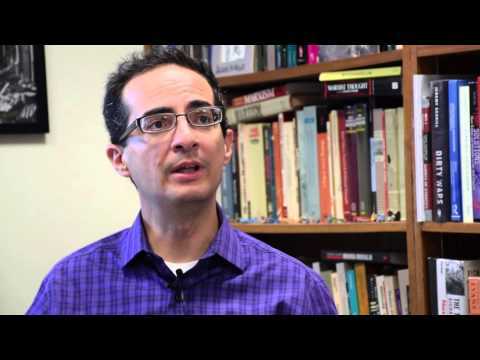 Ernesto Verdeja is an Associate Professor of Political Science and Peace Studies and Director of Undergraduate Peace Studies at the University of Notre Dame. He received his Ph.D. from the New School for Social Research in New York City. His research focuses on large-scale political violence (genocide, war crimes, crimes against humanity), transitional justice, political reconciliation, war crimes trials, truth commissions and reparations. Professor Verdeja is the author of Unchopping a Tree: Reconciliation in the Aftermath of Political Violence and coeditor of Globalization, Social Movements, and Peacebuilding; Responding to Genocide: The Politics of International Action; and Genocide Matters: Ongoing Issues and Emerging Perspectives. At Notre Dame, he is a faculty fellow at the Nanovic Institute for European Studies, the Kellogg Institute for International Studies, and the Center for the Study of Social Movements, and a faculty affiliate at the Law School’s Center for Civil and Human Rights. He is also on the boards of the Institute for the Study of Genocide and the International Association of Genocide Scholars. His website is everdeja.weebly.com.